For better or worse, this is Doctor Who for adults. 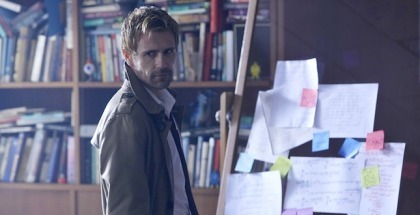 That’s how John Constantine defines himself in Episode 2 of Constantine. After the decision to axe his female sidekick (Liv) for a new one (Zed) in the programme’s pilot, the second episode sees the show still trying to establish its own identity; if last week’s was a standalone prologue, this is effectively the start of the series proper. Things don’t get off on the best foot, as we’re introduced to Zed, who can’t stop drawing pictures of our friendly neighbourhood occult detective. But Angélica Celaya validates the decision, already offering a more substantial partner to her predecessor; one with an understanding of the darker side of life and, more importantly, one not afraid to talk back. So, what kind of man is her sketchbook stalkee? The Darkness Beneath gives us more glimpses of John’s enigmatic character, from a brief card trick to his apparent disinterest in things he doesn’t need to know. That lack of nosiness suits Matt Ryan’s sardonic loner, who already knows his soul is damned after losing a young girl to hell in the pilot. But it also marks out him out as the opposite to another TV figure. An outsider swanning around in a long coat with a female companion solving supernatural occurrences? Constantine is an anti-Doctor Who. Once you notice them, the similarities crop up everywhere, from the fact that it arrives on Amazon Prime Instant Video every Saturday right down to the monster-of-the-week story – a mine in Western Pennsylvania haunted by ghosts, who keep causing the tunnels to cave in. There’s even a hint of a social drama, as we meet a miner who beats his wife. Sure enough, in no time at all, Constantine’s turned up and annoyed the locals. “How do you know about mines?” snipes a suspicious worker in the pub. “Grew up in Liverpool, mate,” John grins. Much like the BBC’s own mysterious traveller, a large part of the fun comes simply from watching the lead actor enjoying himself in the role. Matt Ryan is clearly feeling more and more at home as John, his deadpan aloofness alone making the TV series entertaining. 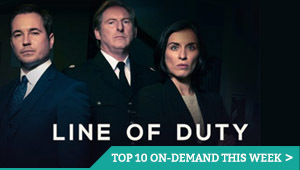 Another thing they have in common is the talent behind the camera: under Steven Moffat’s eye, Doctor Who has recruited an increasingly impressive array of writers, from Richard Curtis to Neil Gaiman. Hellblazer has had an equally strong literary line-up, from Alan Moore’s original Swamp Thing, from which Constantine’s comic book spun off, to Garth Ennis and – yes – Gaiman again. Episode 2 sees Farscape creator Rockne S. O’Bannon pick up the pen. But before you can say “fish fingers and custard” or “timey wimey”, O’Bannon draws a big, black line between the Beeb’s Time Lord and NBC’s exorcist, as our wife-beater comes back from the pit and takes a shower – only to be burned alive. It’s a genuinely shocking opening sequence that sets the tone for the episode. If this is Doctor Who, this is Doctor Who for adults. Unfortunately, with that step up in target audience comes an expectation of equivalent quality. And for all of the twisted deaths and Latin chanting, O’Bannon’s screenplay fluffs it in the dialogue department (a problem the pilot suffered from too). “It’s you!” exclaims Zed, as she bumps into John in the street, before gushing about destiny, dreams and other cliches that feel like they could easily belong in a family show. Weekly critters are fun for all ages, but viewers need to feel respected. 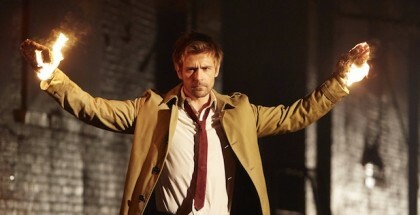 And with the Hellblazer TV series arriving at the time when Doctor Who is enjoying some of its best writing in the modern show’s history, Constantine can’t hide such shortcomings beneath a colourful tie and British accent. “I don’t seek answers to questions that needn’t be asked,” John growls at his unwanted new friend. Celaya smiles back: “I do. I don’t know anything about you but I feel like I should.” If it weren’t for the couple’s fledgling chemistry, these kind of teatime exchanges would sink the whole show, but The Darkness Beneath doesn’t shy away from the shadowy side of its superhero. If the ghosts of the episode are given the kind of gentle motive befitting Doctor Who, that revelation is treated by Constantine in his own, unpitying way. And that vicious streak is enough, for now, to make you curious about finding out more too. Constantine is currently available to buy and download on Google Play.